Trashed: A documentary feature film by Blenheim films with Jeremy Irons. Academy award winning actor Jeremy Irons is no stranger to taking centre stage. Mass production of plastic began in the 1940s, and has since exploded. In 2009, 230 million tonnes of plastic were produced, equivalent to the weight of a double decker bus every two seconds. The increase in large plastic waste in the sea quickly concerned people, because of its visibility. Understandably, the spread of microscopic plastic fragments has gone largely unnoticed by the general public. Kevork Djansezian/Getty Images In this 2011 file photos, customers of Ralphs supermarket use plastic bags to carry their groceries home in Glendale. Glendale is still considering a bags ban. Of the 75 communities across the country that have prohibited plastic bags, two-thirds of them are in California. And since an effort to ban plastic bags at larger stores failed in Sacramento a couple of years ago, environmentalists have trained their sights on the state’s largest city. Los Angeles is now their big whale, and this week, its city council could push a ban on single-use bags forward. It’s not just Heal the Bay. Environment California, NRDC, and other groups spent a lot of time, energy and money pushing for a statewide ban a couple of years back. They lost. Plastic bag manufacturers and the American Chemistry Council pumped money into Sacramento during the debate. But, says Donna Dempsey, it’s not that those groups and others affiliated with them love seeing plastic bags stuck in trees and blowing down streets. Dempsey, a spokeswoman for the American Progressive Bag Alliance, says outlawing single-use sacks just doesn’t work. Local manufacturer Crown Poly has organized its workers to appear at council hearings. The company and its workers argue that plastic provides good jobs in the region. Besides, says Dempsey, according to the federal Environmental Protection Agency, disposable bags make up less than 1 percent of the country’s litter. Heal the Bay’s Sikich counters that the problem isn’t the volume of plastic bags, it’s their fate. Sikich says that happened a few weeks back, when a beaked whale washed up dead in Costa Rica. “After the necropsy, which is like an autopsy for animals, was done they found that it got over 20 plastic bags in it.” In fact, the animal had 10 pounds of plastic in its gut. After the state assembly defeated a California-wide ban, L.A’s city council has moved cautiously towards even considering a ban on single-use bags. When the issue came up last December, councilmembers, while voicing support, simply directed public works officials to report back on how to communicate about a possible ban. Teams of sanitation officials fanned out around the city, talking to shoppers and handing out reusable bags. With enough yes votes this week, L.A. city council would tell the city attorney to start the legal process of writing an ordinance. It’s not clear whether the city must do a full analysis of the environmental impacts of a bag ban, or whether LA can choose to rely on what neighboring cities and the county of Los Angeles have already done. Donna Dempsey of the American Progressive Bag Alliance says the city of L.A. should do its on work. “We do feel that it’s a fair thing for LA to do its own environmental impact report, because everywhere is different, and they really need to focus on the situation in their city,” she says. City officials and advocates all say it would be months before a real ordinance would make its way back to the L.A. city council. Even then, a ban on single use bags could, as in other communities, include half a year or a year more of phase-in time before the rule takes effect. This story has been corrected to reflect that, as Sarah Sikich says, LA is the largest city in the state, not in the nation. The area is naturally susceptible to flooding. Its low-lying geography, which lies beside the Ganges, Brahmaputra, and Meghna rivers, is suitable for its agriculture sector but inconvenient during monsoon season. Natural flooding and heavy rain are a characteristic of Bangladesh, but the 1998 floods were particularly devastating. Due to unusually high monsoon rains and melted water from the Himalaya Mountains, the converging rivers spilt over: more than 1,000 lives were lost, 300,000 homes gone, and 30 million Bengali people homeless. After the water subsided, it was discovered that humans helped cause the flood that covered more than 75 percent of the country. From deforestation to poor flood protection methods, it was obvious that the flood didn't have to be as destructive as it was. However, there was one man-made culprit that caused so much outrage that it was banned four years later. In 2002, the Bangladesh government was the first in the world to ban the use of plastic bags. The year prior, 9.3 million plastic bags were dumped in the country's capital, Dhaka, every day, which contributed to blocked drains and waterways, causing flooding. Since then, myths of a plastic bag island swirling in the Pacific Ocean and images of sea mammals with plastic particles in their digestive systems have bombarded the human psyche into thinking that plastic bags are more environmentally destructive than car emissions and burning of fossil fuels. While foreign countries like Bangladesh, China, and England have taken the lead in banning or levying plastic bags, American cities are finally following suit on both coasts. Now, Los Angeles, the second biggest city in the U.S., will soon vote to ban both plastic and paper bags, in what is the strictest bag ban to be proposed to date. Although the paper industry struggled in the early 2000s, plastic bag bans have given this floundering industry a well-needed boost as more than 40 local jurisdictions in California have either banned plastic bags are in talks to, leaving the market open for paper companies to claim. While the plastic bag has become the poster child as the environmental devil, paper bags have seemed to slip under the radar even though they are worse for the environment. At face value, banning plastic bags looks like a simple and rational step towards a better environment, but what is often overlooked is that the hidden costs of such a ban are a greater detriment. Through interviews with environmental experts, industry insiders, and research from various government documents and independent studies, it is clear that by only banning plastic bags, communities increase their use of paper bags, which wastes more energy in the manufacturing and delivery process, uses more toxic chemicals, which contributes to air and water pollution, and fills up landfills at a greater rate than plastic bags. The Los Angeles initiative follows bans by San Francisco, Malibu, Los Angeles County, and most recently Hawaii. These actions come after AB 1998, a statewide bill seeking to ban plastic bags, was defeated by an Assembly vote in 2010. While environmental groups and proponents of the plastics industry have been vocal about their positions, one group has been shockingly absent from city meetings and political discussions. The paper bag industry has grown in the face of plastic bag bans and while the L.A. initiative would prohibit paper bags from reaching millions of customers, the industry will still remain profitable by leaning on the plastic bag bans already in place. It is admirable that the government has taken the steps they believe necessary to protect the environment, but bans and levies can only do so much in a society of waste. Laws for or against certain environmental actions only work to a certain extent until people stop caring. Society needs to be cognizant of the fact that no law can reverse the country's environmental issues until everyone can commit to a total lifestyle change toward a greener way of living. While neither plastic or paper bags are healthy for the environment, city councils, and governments around the world have been acting irresponsibly by ignoring the consequences of paper bags. Luckily, Los Angeles is working on a solution that corrects the inaccuracies of previous bans. Ban Plastic Bags: Once the law goes into effect, there's six-month grace period before they disappear from big retailers, followed by small retailers after another six months. Ban Paper Bags: Once the law goes into effect, there's six-month grace period before big retailers can charge 10 cents per bag. After another six months, small retailers can charge that, too. And a year after that, paper bags would disappear from those stores. "We have the vision to make a change now," said Los Angeles Board of Public Works Commissioner Steve Nutter. 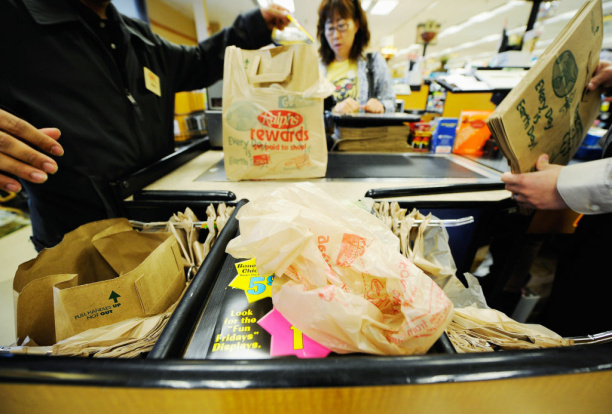 "The evidence on the use of paper bags is that the environmental cost is too high. There is no need to pay that cost anymore." Almost fifty years ago, plastic bags grew in popularity as the newly introduced sandwich bag helped moms around the country pack a messy free lunch. Seen as a more environmentally-friendly and sanitary alternative to paper bags, the plastic bag was introduced to grocery stores after being brought from Sweden to the U.S. by ExxonMobil in 1976. Made of high-density polyethylene, plastic bags are cheap to produce, flexible, durable, waterproof, and chemically resistant. They can hold up to 1,000 times their own weight, are easy to clean, and rarely break. According to the book, "Plastic: A Toxic Love Story", the need to eliminate single-use plastic bags initially began with paper bag manufacturers who saw plastic bags as a threat. Then the cause was taken up by environmental group after environmental group until Captain Charles Moore came upon a stretch of floating plastic debris in the Pacific Ocean in 1997. The Great Pacific Garbage Patch, which was claimed to be the size of Texas, caused an uproar as the dangers plastic had on sea mammals finally hit the mainstream media. Although there is some debate as to the size of the "Garbage Patch," the Algalita Marine Research Foundation has stated that this huge island of plastic trash is an exaggeration as the patch is actually an area of floating plastic particles. From there, foreign countries started banning plastic bags due to the massive amount of litter it caused. Then in 2007, San Francisco made headlines when it became the first U.S. city to ban plastic bags. The city blamed the "white pollution" for littering streets and choking marine life and believed the measure would be the first step towards a greener city. Since then, governments and retailers around the country have moved from plastic to paper and, in total, more than 200 anti-bag measures have been introduced in the U.S. It is easy to understand why plastic bags have become an environmental target. The plastic bag industry is seen by many to be the manipulating, greedy, manufacturing counterpart to the tobacco industry. Plastic bags are stuck in trees, floating in rivers, and matted on beaches. The Guinness World Records named it the most "ubiquitous consumer item in the world," and it's so durable that it could outlive the average person. "There are a lot of facts that came out about plastic bags that made people more passionate in trying to get rid of them," said Leslie Tamminen, Ocean Program Director of Seventh Generation Advisors. Tamminen, who also works as a facilitator for the Clean Seas Coalition, explains that her organization and others like it have pushed for plastic bag policies because they believe it could have a greater effect on the environment by making people more environmentally aware in their everyday lives. "We feel that plastic bag bans, in particular, could cause a consumer behavior change on a life scale," she said. "Once people get used to using a reusable bag, it's amazing how many people start expanding that consciousness to other consumer products." While plastic bags aren't good for the environment, they certainly aren't the environmental menace they are made out to be. Commonly referred to as an urban tumbleweed, single-use plastic bag ban proponents claim that plastic bags fill our landfills, litter streets and beaches, kill sea mammals, use foreign oil, and are impossible to recycle. According to a 2004 report published by the California Integrated Waste Management Board, only .04% of the state's waste is from plastic grocery and other merchandising bags. Plastic bags also fill up little space in landfills because they can be tightly compressed unlike paper, which occupies almost half of overall landfill volume. Environmental groups also argue that plastics don't biodegrade in landfills. While this is true due to the chemical make-up of the bag, modern landfills make it nearly impossible for anything to biodegrade. Slate, an online magazine, explains that landfills are lined on the bottom with clay and plastic to prevent waste from seeping into the soil and are constantly covered to reduce the smell. This means that garbage in landfills receive little sunlight, air, and water, making it difficult for even the most degradable objects to decompose. When plastic bags don't make it to the landfill, they are either littered or taken to recycling facilities. While plastic bags are the most common pieces of litter people see, it is not the most common item that litters our streets and beaches. "You do see plastic bags from time to time; it's noticeable," said John Picciuto, President of Western Plastic Association. "But take a closer look and most of litter is from bottles and cigarette butts." A 2009 national study conducted by Keep America Beautiful found that tobacco products are the most prevalent aggregate litter item, which is roughly 38 percent of all litter in the United States. This includes, cigarette butts, cigars, and packaging. The second largest type of litter are paper products like newspapers and paper bags with almost 22 percent. Plastic items did round out the top three with approximately 20 percent of the country's trash, but plastic trash consisted mostly of plastic bottles, containers, and other plastic packaging besides bags. The most important and passionate area of concern for people are the beaches, which California has over 1,000 miles of, attracting millions of tourists every year. It has been estimated that 100,000 sea mammals and birds are killed by plastic bags every year. While it is true that turtles, seabirds, fish, and plankton have been known to ingest smaller plastic particles, The Times UK revealed in 2008 that most deaths were caused by fishing gear, ropes, and strapping bands as most mammals are too big to get caught up in a plastic bag. "I've never seen a bird killed by a plastic bag," Professor Geoff Boxshall, a marine biologist at the Natural History Museum, said in the article. "Other forms of plastic in the ocean are much more damaging." The Environmental Impact Report conducted by the city of Santa Monica to analyze the city's proposed ban ordinance even states that banning plastic bags won't have a significant effect on coastal and marine habitats. The only accurate arguments that plastic bag ban proponents have is that plastic bags are made from oil and they are hard to recycle. More than 1.6 billion gallons of oil are used each year to make plastic bags, a harsh reality for a society trying to wean off oil. But some local plastic bag manufacturers are recognizing that there needs to be a shift towards using renewable resources. "Everyone is cognizant that plastic bags have a bad reputation. The market is forcing us to do something more," said Cathy Browne, General Manager at Crown Poly. Crown Poly, a plastic bag manufacturer located in the city of Vernon, Calif., has moved away from oil and only uses domestic natural gas or raw materials in its plastic bag manufacturing process. While natural gas still produces greenhouse gases, it is to a less extent than oil and relatively benign when accidentally released into the environment. Unfortunately, whether made from foreign oil or domestic natural gas, plastic bags are rarely recycled. According to California's Department of Resources Recycling and Recovery, the 2009 statewide recycling rate for plastic bags is about three percent. Bags that are placed in recycling bins are still a headache to recycle because the feed must be clean, meaning what goes through the recycling process must only be high-density polyethylene grocery bags and they must not be contaminated by food products. Recycling machinery is also not ideal as plastic bags readily gum up the machines making it necessary to constantly clean them. Most consumers believe paper bags are a better option than plastic bags because of its high recycling rate. The Los Angeles Bureau of Sanitation states that 21 percent of paper bags are recycled statewide, which is due to increased education and convenience. According to a 2007 American Forest & Paper Association Community Survey, 87 percent of the U.S. have access to some form of community recycling program, either through curbside collection or drop-off programs. With plastic, consumers have to go to the drop-off bins at large grocery chains, if they are even aware it is there. Unfortunately, this belief is misguided as paper bags are still more harmful for the environment than plastic. Paper bags are made from trees. The statement should be obvious, but the environmental consequences might not be. A 2008 article from the National Cooperative Grocers Association states that each year, the United States consumes 10 billion paper grocery bags, requiring 14 million trees. Cutting down trees is incredibly harmful for the environment because forests are a major absorber of greenhouse gases. Trees remove carbon and release oxygen into the atmosphere. According to the Intergovernmental Panel on Climate Change, deforestation could account for up to one-third of total carbon dioxide emissions. Not only are greenhouse gases a result of cutting trees, but manufacturing of paper bags produces even more greenhouse gases. According to a 2007 study conducted by Boustead Consulting & Associates, it takes almost four times as much energy to manufacture a paper bag and uses more fossil fuel as does a plastic bag. The same study also reveals that paper mills use twenty times as much fresh water as plastic. Paper bag plants also use a heavy amount of toxic chemicals during the manufacturing process. According to Resueit.com, the majority of paper is made by heating wood chips at high temperatures in a chemical solution. The use of these toxic chemicals contributes to air and water pollution. After paper bags are made, they must be transported to its location. According to the Environmental Literacy Council, it takes seven trucks to transport the same number of paper bags that can be transported by a single truck full of plastic bags. This is due to plastic bags' light weight and compact nature. Transportation, in of itself, creates additional emissions. This is important because there are no paper mills in California and these transportation modes have to cross state lines, greatly increasing emissions. So what is the best solution? People on both the environmental and plastic industry side believe that applying a levy to both plastic and paper bags is a fair solution. "A ban is not the right answer," said Browne, Crown Poly's General Manager. "Consumers have the right to choose what they want, while the government has to educate consumers as to what a better choice is." While no other city in the world has attempted to ban both paper and plastic bags, only one city in the country has decided to levy both. In 2010, Washington, D.C. passed a bill that placed a 5-cent tax on all paper and plastic bags, with the goal of raising $3.5 million from the tax to clean up the Anacostia River. According to the Wall Street Journal, after nine months, it was estimated that the city saw a 60 percent reduction in all bags handed out. San Francisco, which only banned plastic bags, recently expanded its current ordinance by applying the plastic bag ban to retailers citywide, instead of just large supermarkets and pharmacies, and imposing a minimum 10-cent fee on paper bags. While Tamminen from Seventh Generation Advisors agrees that levying both bags is the best solution she emphasizes that it isn't plausible right now. "I think that putting some kind of fee on bags is ideal because you internalize the cost," said Tamminen. "That has been proven to be more successful [than bans] but we don't have that option in California due to AB 2449." Passed in 2006, AB 2449 is a pilot program requiring large grocery stores to create an in-store recycling program for the collection and recycling of plastic bags. Plastic bag manufacturers are required to work with grocery stores to ensure plastic bags are properly collected and recycled. AB 2449 also prohibits cities from levying plastic bags, which has essentially helped create the bans we currently see in California. "It is interesting to see the industries' efforts, in a way, is backfiring on them now," said Kirsten James, Director of Water Quality at Heal the Bay. "Now municipalities are just going with the more aggressive route." The Los Angeles city ban would include all single-use bags, including plastic, paper, biodegradable, and compostable bags. The proposal would apply to at least 7,500 retailers and failure to obey the ban would cost businesses $250-$500 a day. "The time is now," stated James. "The city of L.A. has a chance to be a true leader in one of the most progressive policies we have ever seen before us." Even when AB 2449 ends on January 1, 2013 and the option to levy plastic bags can be apart of the discussion, a bag fee might not be the best solution. While placing a levy on bags is the most convenient proposed solution to the litter problem, the bag tax has been subject to, what a Beacon Hill Institute Impact Report called, the "rebound effect." After the initial shock of the tax wears off, consumptions of bags continues to increase. Ireland, which imposed a 15-cent per bag levy in 2002, saw this happen after an initial bag reduction of almost 90 percent. However, the country saw the sale of heavy-gauge garbage bags and other plastic bag products increase by 400 percent as people started using these bags as trash liners and pet cleaners to replace grocery bags. A "rebound effect" soon followed as people decided it was cheaper and easier to pay the 15-cent fee for a plastic grocery bag they could use multiple times. In 2007, to reverse the trend, Ireland increased bag taxes to 22 cents per bag. While the fate of the Los Angeles bag ban initiative will soon be decided, one thing everyone can agree on is that there needs to be a solution to this problem on a statewide level. Having municipalities with different bag laws is difficult for businesses and confuses consumers. "Because L.A. is a huge population center in the state, I'm hoping that if this passes, it will push the statewide effort so there is consistent policy on a state level," said James. Whether the city decides to ban both plastic and paper, only ban plastic or levy one or both, the end result is to ultimately switch to reusable bags. There are many companies in California, like Project Greenbag, that make lead-free, machine washable canvas bags. Although the battle of the bag is a step in the right direction, a healthier environment cannot be achieved until society commits 100 percent to reducing waste, at all levels. The "rebound effect" that plagued Ireland's initial success is proof of this: In the end, consumers will do what is easiest for them. "It's hard to ask people to change their daily routine," said Tamminen. "But hopefully people will start to understand the gravity of our environmental situation and commit to a greener lifestyle." While decomposing last night's leftovers or trading in that V8 for a hydro-electric-solar powered mini car might not be easiest transition to make, there are baby steps that can be taken for a more environmentally-friendly lifestyle. Bring a coffee mug to Starbucks, recycle take-out containers, walk to the corner store, and yes, leave a couple reusable bags in the car. Just follow the rule that was taught in middle school: Reduce, Reuse, Recycle. As for Bangladesh, after banning plastic bags the country has seen a dramatic shift towards reusable bags. While the area is still susceptible to flooding the government has been spending millions in trying to remove something else from the drains. The main culprit now? The ocean is our playground. We sail on it, we swim in it, we fish from it and without it we don't have 60-80% of the world's oxygen........So why do we abuse it? The reason we abuse it is because most of us don't even realise we are. Covering 70% of the planet, our oceans seem to cope with everything we throw at it, right? Well think again. So let's go back to the beginning. When we were kids at school we were all taught to clean up all the trash in our playground. So why did we change as we grew older. For many of us sailors, the ocean is our new playground, yet we throw our trash in it all the time, not directly, but we certainly contribute. Let's pick two items that are incredibly numerous in our oceans and cause great issues for creatures living in the ocean and the ocean itself, let alone creating health risks to us. Plastic bags and plastic water bottles What do these items have in common? They have both been created for 'Convenience'. This is where it all began for Ocean Crusaders. As a professional skipper in the Whitsundays I began pulling Dead Sea turtles out of the water so they could be inspected by marine parks. The key moment came when one of the turtles I pulled out was found to have a plastic bag formed perfectly in its stomach. It had died of starvation but not before trying to eat 12 cigarette butts, a plastic water bottle cap and 1/2 a coke can. I set out to educate people of the issue and this is my crusade. Our world uses somewhere between 500 billion and one trillion plastic bags every single year. They are big numbers but let's put those numbers into perspective. We see these numbers and we go, O.K that's big but have you ever tried to count to one million, let alone one billion or one trillion. To count straight through from one to 1,000,000 will take you 11 days. Yep, that's right 11 days. Try 32 years to count to one billion. You cannot count to one trillion in your lifetime. Or let's put it another way, grains of rice. To get one million grains of rice you need 25 litres (6.5 gallons) of rice. So multiply that by 1,000 to get one billion. So you need 25,000 litres of rice (6,500 gallons). So let's look at those numbers again. We use somewhere between 500 billion and one trillion plastic bags every year. Based on 500 billion, if we joined them end on end they would circumnavigate the world a whopping 3.1 million times. Imagine laying them out flat, we could wrap our world hundreds of thousands of times. So now you understand the scale of the issue, let's go a step further. This is just plastic shopping bags. Add to this figure the plastic used to wrap bread, toilet paper and what about the plastic that pretty much every item in the world is packaged in. It is a massive number that the plastic manufacturers love but our environment hates. Plastics are like diamonds.........they last forever!!!!! This is my favorite saying as it is so true. Plastic will never go away. It does not break down, it breaks up.....into millions of smaller pieces that break up further through a process called photo degradation. In samples taken from the North Pacific Garbage Patch 10 years ago it was shown that pieces of plastic the size of plankton were floating around imitating this micro-organism. In fact there was a ratio of six pieces of plastic to every plankton. Studies last year showed an increase to 45:1 and this is before the garbage from the Japanese Tsunami in March 2011 makes it to this region, believed to be another 1.5 million tonnes of trash floating around the north pacific. The standard single use plastic bag will be around for over 1,000 years before it begins to photo-degrade. So with 500 billion of them added to our world every year, we are creating a problem we cannot clean up. That's probably why there is enough rubbish in the North Pacific to cover the entire country of Australia 3m (10ft) deep. 50% of plastic bags that make it to the ocean come from landfill so putting them in the bin is not a solution. When you add to these statistics the fact that 100,000+ marine creatures and one million sea birds die because of plastic suffocation or entanglement every year, it is time for all of us to change our habits and as ocean users, we should be leading the way. You all know the alternatives for shopping bags. It's only because we are lazy that we don't use them as often as we should. Just remember to put them back in your car when you've unpacked the shopping so they are there when you want them next. If you do need to use plastic bags for rubbish bins etc. use compostable bags that by law have to decompose within a short period of time, usually six months maximum pending your country. If we don't make changes now, we'll be sailing on oceans of plastic before we know it, clogging our engine intakes and contaminating the fish we all love to eat, or worse, slowing us down when we race. Say no to plastic bags. Ocean Crusaders was founded by Ian Thomson in June 2010 after setting the world record for the fastest solo circumnavigation of Australia. He is on a crusade to educate the world of the issues our oceans are facing. An online education program is available for primary school teachers to present to their students or for parents to present to their children. Visit www.OceanCrusaders.org for more details. Sailors should sign their yacht up to the 'Ocean Safe Certification' program to show their support for the campaign here and don't forget to like us on our Facebook page. Part 2 in the series focuses on Plastic Water Bottles. In part one, we looked at plastic bags. We went through the numbers and quantified how much one million and one billion is in reality. Let's revisit that before we move onto Plastic water bottles. To count straight through from one to 1,000,000 will take you 11 days and it will take 32 years to count to one billion. You cannot count to one trillion in your lifetime. In grains of rice, to get one million grains you need 25 litres (6.5 gallons). For one billion you need 25,000 litres of rice (6,500 gallons). The world now consumes 200 billion litres of bottled water every year. The majority of this is in plastic bottles. You can pretty much equate each litre into one bottle. So that makes 200 billion water bottles that we need to dispose of or recycle every year. How did we get to drinking this much water out of bottles when we have perfectly good water out of the taps? Well you can blame the big soda drink manufacturers. Back in the 80's they realised that we can only drink so much soda. In order to keep growing they needed to create a new market. They decided to bottle water. They then went on a campaign to sell us, saying that bottled water is way better for us than water out of the tap. We fell for it and today it is a multi-billion dollar market. We now ship water from Fiji to Italy, Italy to USA and Paris to Australia! So is it better for us or not? Well 40% of bottled water is actually filtered tap water. Some are known to be better, some worse. No matter what water brand you buy though, there is one key that should give us the answer. It is called a 'Used by date'. Water does not go off in rivers and lakes or in our taps so why does it have a used by date? It is because plastic water bottles contain toxins that leach into the water, contaminating it and also affecting the taste. It's that plastic taste you get occasionally. It's actually killing you slowly. What are these toxins? The big one is Bisphenol A (BPA). There are more and more studies these days on this toxin and it has been proven to cause breast cancer, ADHD, autism and the list continues to grow. To put it bluntly, toxins in plastic consumed during pregnancy is a major issue. Heating kids drinks and food in plastic just adds to the issue. So it's not healthy for us so how do they get away with it. It is all in the name of convenience. We are too lazy to take our own bottle and refill it. Tonight I saw the most crazy advert on TV. Coca Cola's brand of water here in Australia 'Mount Franklin' is promoting that their water is in bottles that are made of just 30% of the plastic of other brands and that they crush down really easily. Initially I thought that at least it is less plastic but then I thought about it. They use less plastic which costs them less. Win to Coca Cola. Oh and you can't reuse it as it crushes too easy so you have to buy another bottle. Win to Coca Cola. Around the world only 30% of plastic is recycled so that means 66.6 billion of these bottles will go into landfill or worse still, into the oceans. The caps on water bottles are still not recyclable so that means 200 billion bottle caps in our world that won't break down, they'll last forever. So as a boater, what can you do? Simple, buy S/S water bottles and refill them. If you want to buy water, buy it in large containers or filter it from the tap at home. S/S bottles may cost a bit but the savings you will make in not buying water will pay for this bottle countless times. It means you create less waste, you save money and the environment will love you for it. Everybody wins. If you're in a yacht club or corner store, purchase or lease a water vending machine. You can even get flavoured water dispensed. If every shop replaced the fridge they store bottled water in with a water vending machine, they still make money but don't kill the environment. Oh and it would be cheaper for you too. I don't want to sail on an ocean of plastic and I'm sure you don't want to either. We need to change our habits today. It is the little things that count towards making our oceans safe for the future. Say no to plastic water bottles. Ocean Crusaders was founded by Ian Thomson in June 2010 after setting the world record for the fastest solo circumnavigation of Australia. He is on a crusade to educate the world of the issues our oceans are facing. An online education program is available for primary school teachers to present to their students or for parents to present to their children. Visit the Ocean Crusaders website for more details. Click here to view part one of Plastic Oceans. Labels: Ocean Crusaders, PET bottles, Plastic Facts, Plastic Infographic, Top Five Littered Items, What Can You Do? Just yesterday, MSNBC covered a story about the Pacific Garbage Patch having grown 100-fold in the last 40 years. In places in the gyre, as it’s called, there are 46 times more plastic bits than there is plankton. Plastic does not biodegrade and persists in the environment for eons, so seeing a pile of plastic trash in the ocean just north of Hawaii has always seemed to put a damper on living in paradise for many Hawaii residents. Perhaps cosmically, we were due for a little great news. Following the City Council’s 7-1 vote in favor, Honolulu Mayor Peter Carlisle signed SB2511, a bill banning plastic bags in retail stores yesterday across Honolulu County, which comprises the island of Oahu and Hawaii’s capitol city of Honolulu. What makes the bill’s passage extra significant is that Hawaii’s other counties had previously banned plastic bags, meaning that Hawaii has just officially enacted the first full statewide ban on plastic bags in the nation. Just a year ago, the American Chemistry Council, a lobbying group representing the plastics industry, managed to bribe politician Joe Souki to help defeat a similar plastic bag measure. No kidding. It was in broad daylight, they paid him $24,000 in quote-unquote consulting fees. He helped the ACC ward off a plastic bag ban and styrofoam ban. But they only delayed the inevitable, as a plastic bag ban in one of the most beautiful places in the world had tremendous public support. Read the entire article via the link above. Just yesterday, MSNBC covered a story about the Pacific Garbage Patch having grown 100-fold in the last 40 years. In places in the gyre, as it’s called, there are 46 times more plastic bits than there is plankton. Plastic does not biodegrade and persists in the environment for eons, so seeing a pile of plastic trash in the ocean just north of Hawaii has always seemed to put a damper on living in paradise for many Hawaii residents. Perhaps cosmically, we were due for a little great news. Thus, bioplastic bags are fine, as are reusable shopping bags that may contain some plastic inputs. Down To Earth, a local all vegetarian health food store, has been using biodegradable bioplastic bags for years. Under Honolulu’s bill, which phases in the ban over 3 years, plastic bags distributed for loose vegetables, flowers, and the like would still be allowed, but bags with the purpose of carrying retail items out will incur fines of up to $1,000 per day if violated by a retail store. Ironically, GBO Hawaii, the sustainability-themed board game we’ve developed here at GreenBusinessOwner.com incorporates plastic bag bans and oil industry lobbyists, and I have to admit, this is a day I didn’t think I’d ever see when I started creating the game. The card at left is a part of the game. Yeah, we had fun creating this game. Above: A harbor seal made up of so many lids she's been dubbed Lydia. KPBS arts reporter Beth Accomando explores the new Washed Ashore Exhibit. The Chula Vista Nature Center re-launched last month as the Living Coast Discovery Center (located at 1000 Gunpowder Point Drive in Chula Vista). Its first exhibit under its new moniker is Washed Ashore: Plastics, Sea Life and Art. The exhibit runs through September 3. Take a tour of the exhibit with its creator. Listen to the radio feature or watch the video. Above: Plastic debris collected from beaches. Above: A jelly fish created out of discarded plastic water bottles by artist Angela Haseltine Pozzi. It is an interactive sculpture. ... Giant marine sculptures like a jellyfish made up of hundreds of discarded plastic water bottles strung together. "These were just water bottles that all washed ashore there's a huge amount that come ashore. There are water bottles that we've been getting from the Beijing Olympics," says artist Haseltine Pozzi. She has been gathering garbage from the beaches in her coastal Oregon home for years as part of the Washed Ashore Project. Washed Ashore is a community project Haseltine Pozzi started in her Bandon, Oregon. The non-profit organization strives to educate and create awareness about plastic pollution through art. The sculptures on display at the Living Coast Discovery Center use about 3 tons of plastic debris picked up from Oregon beaches. "We don't cut up everything into beautiful tiny little pieces where you can't see where it came from, this is the real stuff. You can actually tell that that's a bottle." Or that the head of a turtle is a garbage bin lid. "[The lid] came ashore and I thought that's gotta be a turtle. Sometimes I get inspired by the material, it just speaks to me. Most of the stuff that we get off the beach is coming from the middle of the ocean or from overseas. We process it by hosing it down and sorting it and scrubbing it and soaking it and cutting it, drilling it," says Haseltine pozzi. Then she turns the trash into beautiful sculptures. Above: KPBS arts reporter Beth Accomando takes a tour of the Washed Ashore Exhibit at the Living Coast Discovery Center with artist Angela Haseltine Pozzi. The large jellyfish sculpture is meant to be interacted with and when its tentacles are moved around the bottles sound a little like the ocean waves.It's lovely and fun but it also has a message. "The sea jellies in the ocean are looking just like plastic bags to turtles," says the artist," and turtles eat jellyfish." That message gets through to kids like 9-year-old Meghan Palitz, who embraces "Tula the Turtle" like a beloved pet. Maybe that's because her mother works with the Center and Meghan seems very at home among the giant sculptures. "It's supposed to teach kids how much like full of trash the ocean is and how we should take care of it. And I think it really works," says Palitz, "Some leatherback sea turtles eat jellyfish and if a plastic bag is floating in the ocean it also looks a lot like jellyfish and they'll eat it and it could kill them." The accessibility of the art attracted Dr. Brian Joseph, the executive director of the Living Coast Discovery Center. "I was overwhelmed and touched; it was something that was understandable by children, it's something that they can touch, everyday objects, colorful things out of their own lives that end up in the environment, and I thought it had a really powerful message for children," says Dr. Joseph. The Center's purpose is to connect people to nature and the environment with the hope of encouraging positive change. Washed Ashore directly addresses that message by drawing attention to ocean pollution in a novel way. "When you first look at these you think these are very beautiful sculptures, and then when you approach them closer and closer you are filled with horror because they are everyday items that we discard in the environment, and we don't think twice about it, and it never breaks down, it'll be here 500 years from now," explains Dr. Joseph. Haseltine Pozzi adds, "People don't realize how bad it is by just listening to statistics and people talking and seeing charts and I thought I need to do something that makes people really not ignore the problem. so make giant animal and they won't ignore it." Above: Henry the Fish is one of a group of sculptures made from plastic debris picked up at beaches. In addition to Henry the Fish that greets visitors as they enter the Living Coast Discovery Center, there are also Styrofoam coral reefs, a Flip Flop Fish, and a fish made of plastic pieces with tooth marks from sea creatures that tried to eat the plastic and most likely died as a result. "Although this is a small piece, sometimes people feel it's the most powerful because the bite marks by fish and crab in plastic," says Haseltine Pozzi. Haseltine Pozzi was an educator for 3 decades before she started researching the impact of plastics on ocean habitats. "The plastic pollution problem in the ocean is huge and a massive problem and it is affecting every bench in the entire world. And it's basically because humans have created this thing called plastic which lasts forever." She was confident her clever recycling of trash would appeal to kids. But she wanted to reach an even wider audience. "I don't want to be preaching to the choir, I do want to reach people who do litter on the beach." Because the Washed Ashore Exhibit can show them how every action has a tangible result. "I tell people every piece of plastic here in this whole exhibit was once purchased by somebody and then it got tossed aside. And then it traveled and landed on a beach. One person at a time decided to pick up one piece of plastic at a time," says Haseltine Pozzi." The Living Coast Discovery Center plans to use the exhibit to prompt a larger environmental education effort because as Haseltine Pozzi says, "Every piece of plastic tells a story – and it never goes away." Researchers have found that small particles of plastic are churned further underwater by wind than previously estimated. 10 a.m., May 1, 2012--Decades of research into how much plastic litters the sea may have only skimmed the surface. A new study reveals that wind drives confetti-sized pieces of plastic debris deeper underwater than previously believed, more than doubling earlier estimates of the pollutant’s presence in oceans. UD's Center for Composite Materials has received a grant from the Defense Advanced Research Projects Agency to develop a rapid prototyping process to manufacture orthoses for injured soldiers. Reporting in Geophysical Research Letters last month, Kukulka and co-lead author Giora Proskurowski of the University of Washington said that data collected from just the surface of the water commonly underestimates the total amount of plastic in the water by an average factor of 2.5. In high winds the volume of plastic could be underestimated by a factor of 27. The paper detailed a new model that researchers and environmental groups can use to collect more accurate data in the future. Descriptions of the so-called great Pacific garbage patch in widespread news reports may have led many people to imagine a giant, dense island of garbage while in fact the patch is made up of widely dispersed, millimeter-size pieces of debris. This waste is a concern because of the impact it might have on the environment. For instance, when fish ingest the plastics, it may degrade their liver functions. The particles also make nice homes for bacteria and algae, which are then transported along with the particles into different regions of the ocean where they may become invasive and cause problems. Proskurowski gathered data during a 2010 North Atlantic expedition where he and his team collected samples at the surface and at depths down to 100 feet. “Almost every tow we did contained plastic regardless of the depth,” he said. By combining the data with wind measurements, the researchers developed a simplified mathematical model that could potentially be used to match historical weather data, collected by satellite, with previous surface sampling to more accurately estimate the amount of plastic in the oceans. The team plans to publish a “recipe” that simplifies the model so that a wide range of groups investigating ocean plastics, including those that aren’t oceanographers, can easily use the model. Next Kukulka and his team are working on simulating plastic particle motion based on fully three-dimensional ocean turbulence. Other co-authors of the paper are Kara Lavendar Law and Skye Morét-Ferguson of Sea Education Association and Dylan Meyer, an undergraduate student from Eckerd College. Support for the project came from National Oceanic and Atmospheric Administration and UD's School of Marine Science and Policy. The researchers relied on data collected by students participating in the Sea Education Association’s Plastics at SEA program. The amount of plastic in the ocean area known as the "Great Pacific Garbage Patch" has increased a hundredfold since the early 1970s, according to a new study, and the alarming findings could pressure California and other coastal states to do more to reduce plastic trash. "We were really surprised. It is a very large increase," said Miriam Goldstein, a Ph.D. graduate student in biological oceanography at the Scripps Institution of Oceanography and lead author of the study. "Plastic had been detected in the open ocean in the early 1970s," she said. "People were raising the alarm then. The fact it has gotten so much worse is really disappointing." During an expedition in 2009, Scripps researchers took extensive water samples 1,000 miles west of California, then compared the amount of plastic they found with samples taken by other researchers dating back to 1972. While many of the samples 40 years ago found little or no plastic, vast stretches of the North Pacific are now polluted with billions of tiny pieces of confetti-like trash that comes from garbage that floats out to sea and breaks down in wind and waves. The tiny bits sit on or near the surface, where they are eaten by fish, sea turtles and other marine animals that confuse them for food. The latest samples show that the garbage patch has grown not in size but in density: There are roughly 100 times more pieces per cubic meter of water than were in samples during the1970s. The research, published in Wednesday's online editions of the journal Biology Letters, also found the debris is affecting the food web. Goldstein and her co-authors, Marci Rosenberg of UCLA and Scripps biologist emeritus Lanna Cheng, found a growing number of eggs from a marine insect commonly known as a "water strider" or "sea skater." The bugs normally lay eggs on pieces of wood, feathers and other naturally occurring objects that float. But with the increasing amount of plastic, they have found a new place. Goldstein said Tuesday that more research is needed to see what impact the change will have on other species. But because the bugs eat zooplankton and fish larvae, an explosion in their population could lead to a reduced food supply for other animals, including fish and turtles, which eat the same prey. More bugs also could mean more food for animals that eat them. The study this week follows another study last year by Scripps scientists that showed 9 percent of fish collected on the expedition to the Pacific Garbage Patch in 2009 -- nearly 1 in 10 -- had plastic in their stomachs. Goldstein said cleaning up the plastic trash in the ocean is virtually impossible, given the vast scale. The Pacific Garbage Patch, for example, stretches for hundreds of miles and is located 1,000 miles north of Hawaii. "Most people who work on this issue agree that prevention is the critical step," she said. "Once a piece of plastic is in the ocean, it is really hard and expensive to get it out again." This week's study is expected to ramp up calls for more cities and states to ban plastic bags and plastic foam packaging. In California, 14 billion plastic bags are distributed annually, and only 3 percent are recycled. In 2010, the state Senate voted 21-14 to defeat a bill that would have banned plastic bags from being given out at grocery stores and other retailers, after heavy lobbying and donations from the American Chemistry Council and the plastics industry. Since then, cities and counties have been steadily passing their own bans. As of this week, 45 California cities and counties including San Francisco, San Jose and Oakland have banned plastic bags at grocery stores and other retailers. Meanwhile, more than 60 California cities and counties have restricted or banned polystyrene foam, commonly known as Styrofoam, with some banning its use in restaurants and others banning it at city events. Because about 80 percent of the trash in the Pacific Ocean comes from land -- running off roads and into creeks and storm drains, or blowing off beaches when left as litter -- this week's study not only shows the need for more laws, it also illustrates a need for a change in behavior, said Kaitilin Gaffney, Pacific program director of the Ocean Conservancy, an environmental group. "Clearly there is too much plastic in the ocean. An increase of one hundredfold in the past 40 years is alarming by any measure," Gaffney said. "This is a problem created by personal action, and frankly, personal carelessness. Ultimately, we need a behavior shift," she added. "When I was a kid, everybody smoked. Now most people don't smoke. The solution really is to move away from single-use items, and we need people to basically be more thoughtful." Paul Rogers covers resources and environmental issues. Contact him at 408-920-5045. BAGS: 45 California cities and counties have banned plastic bags at grocery stores and other retailers, including San Francisco, San Jose, Oakland, Palo Alto, Santa Cruz County, Santa Clara County, Alameda County, Los Angeles County, Marin County, San Luis Obispo County, Sunnyvale, Pasadena, Long Beach and Monterey. STYROFOAM: Meanwhile, more than 60 California cities and counties have restricted or banned polystyrene foam, commonly known as Styrofoam, with some banning its use in restaurants and others banning it at city events. They include San Francisco, Oakland, San Jose, Los Angeles, Santa Cruz, Palo Alto, Monterey, Richmond and Salinas. SEAPLEX researchers encounter a large ghost net with tangled rope, net, plastic, and various biological organisms during a 2009 expedition in the Pacific gyre. Matt Durham (seen wearing a blue shirt) is pictured with Miriam Goldstein. The amount of plastic trash in the "Great Pacific Garbage Patch" has increased 100-fold during the past 40 years, causing "profound" changes to the marine environment, according to a new study. Scientists from Scripps Institution of Oceanography in San Diego found that insects called "sea skaters" or "water striders" were using the trash as a place to lay their eggs in greater numbers than before. In a paper published by the journal Biology Letters, researchers said this would have implications for other animals, the sea skaters' predators -- which include crabs -- and their food, which is mainly plankton and fish eggs. The scientists also pointed to a previous Scripps study that found nine percent of fish had plastic waste in their stomachs. The "Great Pacific Garbage Patch" -- which is roughly the size of Texas -- was created by plastic waste that finds its way into the sea and is then swept into one area, the North Pacific Subtropical Convergence Zone, by circulating ocean currents known as a gyre. NOAA. This map shows the North Pacific Subtropical Convergence Zone within the North Pacific Gyre. The Scripps Environmental Accumulation of Plastic Expedition, known as SEAPLEX, traveled about 1,000 miles west of California in August 2009. A statement on Scripps' website said the scientists had "documented an alarming amount of human-generated trash, mostly broken down bits of plastic the size of a fingernail floating across thousands of miles of open ocean." Scripps graduate student Miriam Goldstein, SEAPLEX’s chief scientist, said that plastic had arrived in the ocean in such numbers in a "relatively short" period. Dec. 29, 2007: NBC's Kerry Sanders reports on a huge mass of garbage floating in the Pacific Ocean that is killing marine life and growing larger each day. "Plastic only became widespread in late '40s and early '50s, but now everyone uses it and over a 40-year range we've seen a dramatic increase in ocean plastic," she said. "Historically we have not been very good at stopping plastic from getting into the ocean so hopefully in the future we can do better." Jim Leichter / Scripps Institution of Oceanogra. Researchers found fish larvae growing on pieces of plastic, such as the one above. Sea skaters -- relatives of pond water skaters -- normally lay their eggs on flotsam such as seashells, seabird feathers, tar lumps and pumice. The sharp rise in plastic waste had led to an increase in egg densities in the gyre area, the study found. "We're seeing changes in this marine insect that can be directly attributed to the plastic," Goldstein said in a statement. She told BBC News that the addition of "hundreds of millions of hard surfaces" to the Pacific was "quite a profound change." Samples taken by the scientists showed how marine life, such as small velella pictured above, lives alongside pieces of plastic. "In the North Pacific, for example, there's no floating seaweed like there is in the Sargasso Sea in the North Atlantic. And we know that the animals, the plants and the microbes that live on hard surfaces are different to the ones that live floating around in the water," she added. A garbage patch has also been found in the Atlantic Ocean, lying a few hundreds miles off the North American coast from Cuba to Virginia. Oceanographer Curtis Ebbesmeyer, who said he coined the phrase the "Great Pacific Garbage Patch," told msnbc.com by phone that the only solution was to switch to using biodegradable plastic and let the plastic gradually disperse. "We can't clean it up. It's just too big. You'd have to have the entire U.S. Navy out there, round the clock, continuously towing little nets. And it's produced so fast, they wouldn't be able to keep up," he said. Ebbesmeyer said in 10,000 years scientists might find a layer of plastic in the ground and use this as evidence of "the plastic people."